There are thousands of TV channels waiting to be discovered! From all over Europe, Russia, the Middle East and beyond. Receiving these channels is a lot easier than you might think. We can upgrade your existing system, or install bespoke receivers and decoders. And don't put up with second best. Internet TV is often unreliable and covered in unnecessary adverts. Why tolerate poor quality? Watch TV as it is meant to be! Already have satellite TV? We can upgrade your equipment and expand your channel list. Or call is for a quote on a brand new system tailored to your needs. 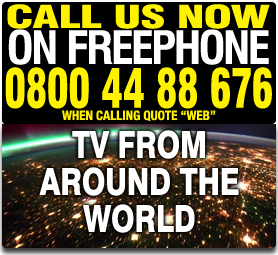 Already receiving Freesat or international TV but experiencing problems? We can fix hardware faults and retune your receiver. Call us on Freephone 0800 4488676. With over 25 years repair and servicing experience, we have the skills and facilities to solve your TV problems. See also our aerials page. Whether you want to see channels you are missing, or keen to discover new content, contact us to start getting TV from around the world.